“The Pro Tours’s hottest coach” (Golf Digest) scores the perfect follow-up to his bestselling golf guide, Unconscious Putting. Dave Stockton is hotter than ever. The 2011 U.S. Open winner, Rory McIlroy, studied with the renowned instructor and two-time former PGA champion, and credits Stockton’s teachings as the reason behind his own putting success. In Unconscious Putting, Stockton introduced amateur players to the techniques, strategies, and mental processes he uses to help tour players find so much success on the green. 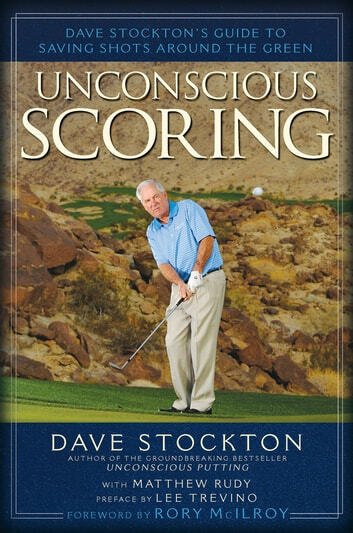 Now, Unconscious Scoring completes Stockton’s short-game education by teaching readers how to make the most of shots around the green—the best place to achieve lower scores. Simplicity is the key to Stockton’s remarkable instruction success, and he breaks down the short game into two components—low shots and high shots—explaining both the technique and the context of how and when the shots should be used. Besides McIlroy, Stockton has worked with champions such as Phil Mickelson, Yani Tseng (the number-one ranked woman in the world), and Annika Sorenstam. In Unconscious Scoring, Stockton illustrates his principles with examples from his week-to-week sessions with these and many more of the game’s top players. Including black-and-white and color photos and instructional video tags, Unconscious Scoring reveals the simple processes and transformative insights that every player—whatever his or her handicap—yearns to master.